Friend of the blog Philip Skinner kindly donated to Geek Girl Con's DIY Science Zone. As it is my policy that any over-$20 donation gets their own blog post, Philip asked me to look at Perkin Elmer Informatics' new electronic notebook software, Elements. Electronic lab notebooks have already penetrated most larger scientific organizations, industrial or academic. Smaller companies or universities may not have the institutional support to offer a standard electronic notebook format. Towards that end, Perkin Elmer Informatics has come up with Elements, a simple cloud-based electronic notebook/project space that can be used to write up any scientific experiment in a collaborative, real-time format. Your coworkers can see what you're up to and you can see what your collaborators are doing as well. While Elements is aimed at all scientists, I've approached this from the perspective of a bench chemist. 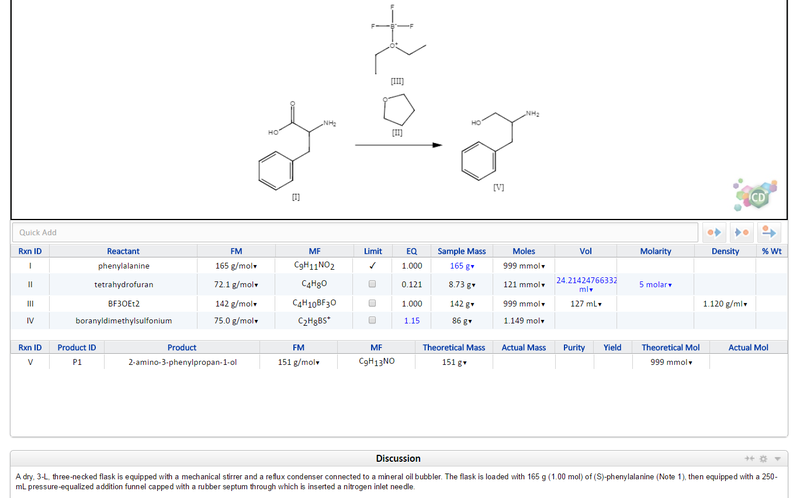 Perkin Elmer being the owners of ChemDraw, Elements contains a HTML5 version of the program. Click a few buttons, and you can use the in-notebook format to start drawing up your reaction. As you're drawing your experiment in the page, Elements automatically populates the entries in the stoichiometry table. Adjusting reagent equivalents is simple; the program will adjust the masses accordingly. The "quick add" line is helpful, assuming the database has your reagent. Phenylalanine, THF, BF3-etherate -- not a problem. Sodium borohydride and borane-dimethylsulfide? Not so much. Even then, you can use the ChemDraw to draw your reagents in the window and the stoichiometry table will update itself. Other than the donation to the DIY Science Zone, CJ received no compensation for this product review. Interesting, but how many seats do you get for the 1yr subscription? If it is one chemist/subscription, that can add up pretty quickly for a small company. Just my 2cents. $480/year? That's per head? No way. I used Cambridgesoft's e-notebook for many years and, once I learned how to exploit many of its features (attaching pdfs, spectra, excel sheets, searching by structure, etc. ), I really liked it. Although I had to deal with database issues (unmanageable size/corruption/backups/recovery), loss of data when the program crashed, and many glitches, I liked it. I'm assuming that the interface must way better now. I'm going to take a look. Anyway, I don't think companies/universities would like the idea of storing research data "in the cloud", where their plans/experiments/results can be seen by Perkin Elmer and maybe others. It was a huge leap forward when we switched from paper notebooks to Cambridge's ELN years ago. From then on, our frustration with the software gradually rose to the point when we are looking for more flexible and user friendly alternative suitable for a small research group within a small generic pharma firm. Can anybody provide me with a suggestion based on personal experience? Lot's of organizations have become frustrated with the buggy and clunky cambridgesoft ELN now owned by Perkin Elmer. We use RSpace. It's modern, fast and simple, cheap and works really well with the eCAT sample tracking system. It even lets us link out to all of our files in dropbox and google drive. For those who come across this post, a sales rep told me the price is $120/year per person or $60/6-months per person. Nice article, it's pretty interesting. Here I have a link to Connect that could be interesting for you. Any good theories about the airbag recall? "Of course I own this facility!" Get rid of the mole? Are you gonna get cancer? Me? Probably.